The Asus ZenFone 5Z was launched recently at a highly competitive starting price point of Rs. 29,999. A price, at which the phone is bringing flagship grade specs including a Snapdragon 845 processor, 6/8 GB of RAM, and 64/128 GB of storage. As far as the hardware is concerned, the phone definitely looks like it’ll have some pretty amazing performance, so we put the ZenFone 5Z to the test to see what the performance of the phone is like. 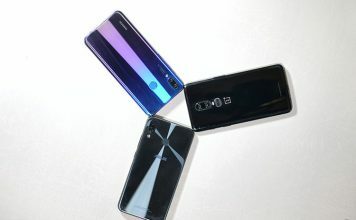 In order to test out the performance of the ZenFone 5Z, we put it up against some of the standard benchmark tests to get an idea of where it stands relative to other flagships out there, especially its primary competitor, the OnePlus 6 (Starts at Rs. 34,999), and then moved on to testing some of our favorite games on the phone to see how it handles gaming. Note: We have the 6GB RAM 64GB storage variant of the ZenFone 5Z with us, and are performing the benchmarks on it. In synthetic benchmarks, the ZenFone 5Z performs admirably well getting decent scores across Geekbench 4, and AnTuTu benchmarks. In Geekbench 4, the ZenFone 5Z scores a pretty impressive score, getting 2443 in the Single Core test, and 9030 in the Multi Core test. That’s pretty similar to the scores our OnePlus 6 posted on Geekbench 4, however bear in mind that we benchmarked the 8GB RAM variant of the OnePlus 6. 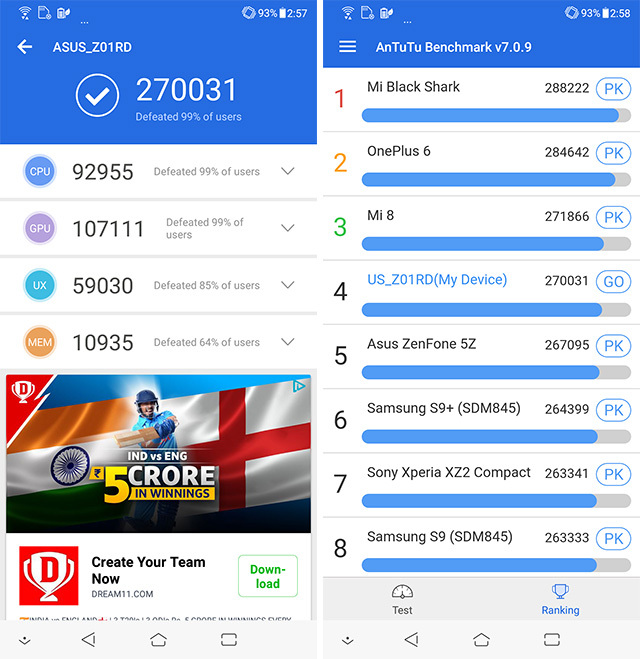 In AnTuTu, the ZenFone 5Z impresses again, scoring 270031 overall. In our benchmarks of the 8GB variant of the OnePlus 6, it scored 267128 in AnTuTu; however, judging by AnTuTu’s ranking sheet, the ZenFone 5Z lags behind the OnePlus 6 in scores. Synthetic benchmarks are great for getting an idea of where a phone stands in terms of raw performance power, however, performance in real-life is what matters more to me, so I put the ZenFone 5Z through some of the games I play a lot. I tried playing Asphalt 8, PUBG Mobile, Tekken, and Modern Combat on the phone, and the results were pretty much what you’d expect. 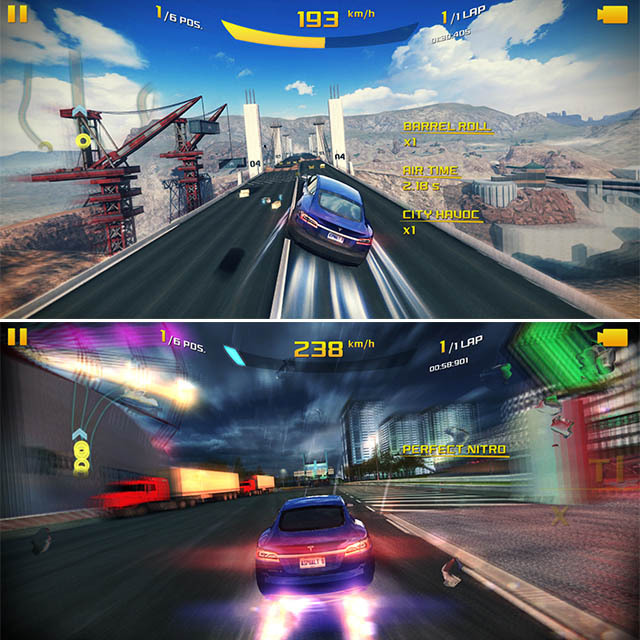 In Asphalt 8, the phone didn’t break a sweat. I played a couple of races in Asphalt, including in Nevada and Tokyo, and did everything I could possibly do in the game – take downs, stunts, nitro-boosts, and even crashes. Not once did I feel like the phone was stuttering at all. Plus, even after around 30-40 minutes of playing the game, the phone didn’t feel warm at all. That’s definitely a plus. I moved on to PUBG Mobile next – a game that can really push a smartphone thanks to its huge open-world environment, graphics, and the fact that it’s in beta so the optimizations aren’t nearly as optimized as they’d otherwise be. By default, the game selected the highest graphics settings, which in itself is a good sign, and while I was playing the game, I didn’t notice any stutter or lag. Not that I was expecting the phone to be unable to handle PUBG; after all, it is a smartphone that packs in flagship grade hardware and ample RAM to handle demanding games like PUBG Mobile. I even tried to record the gameplay while playing, and it didn’t suffer at all. Looks like 6GB will suffice even if you want to record and share your PUBG gameplay with others. 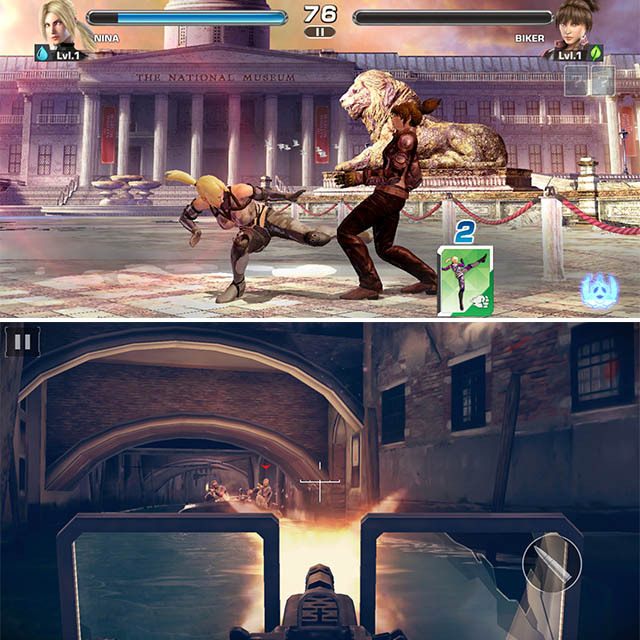 I also played Modern Combat, and Tekken on the ZenFone 5Z, and both those games worked pretty well. 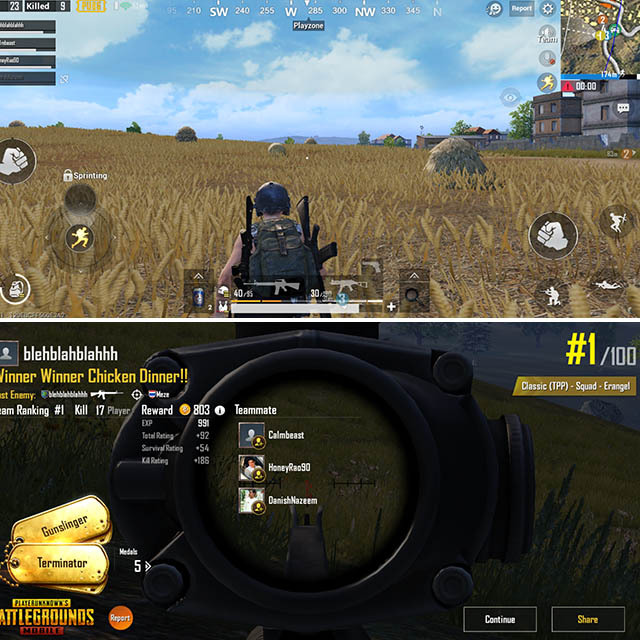 I wasn’t really worried about the phone handling these games after running PUBG Mobile the way it did, and the phone didn’t let me down. As per my expectations, both the games ran extremely well on the phone, and I didn’t notice any stutters or frame drops at all. 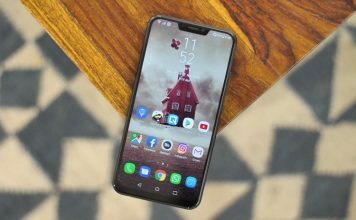 Asus ZenFone 5Z Gaming Review: Pretty Impressive! The ZenFone 5Z is definitely a pretty impressive smartphone when it comes to performance. In both synthetic benchmarks and gaming performance, the phone absolutely blazes through anything you throw at it. After testing the ZenFone 5Z’s performance extensively, I can safely say that the phone performs as good as the OnePlus 6 does in these tests, and will not leave you wanting in terms of overall performance of the phone. 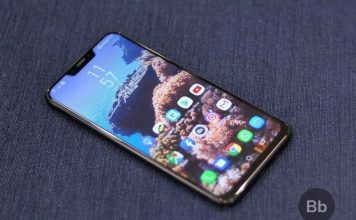 Plus, with the AI Boost feature in the ZenFone 5Z you can push the phone even further if you ever need to, however, I sure didn’t feel the need to do that in all my usage of the brand new flagship from Asus. The ZenFone 5Z starts at Rs. 29,999, and is a pretty mind-blowing performer at the price.